Obverse: HUNGER TALER, Death, seated on rubble and daily ration board, weighs out fish with kalorie banner in its mouth. Near the bottom left are the incuse dates 1947/48. Reverse: MUNICHER'S LONG PERIOD OF SUFFERING 1939-1945, Guido's rather stilted Munich Kindl bisects Munich's WWII statistics; on left, 19,800 fallen, 12,000 missing, 265,000 homeless and on right, 66 aerial attacks resulting in 6,250 dead, 10,600 buildings and 82,000 apartments destroyed. Munich's Church of Our Lady and other buildings are aflame. This medal has been listed under Karl's name only or Guido's name only. It is our belief that this medal is a composite of both Karl and Guido's work. This is likely Karl's last work as he was ravaged by multiple strokes in 1947 and again 1950 which resulted in his death. We know that Guido used essentially the same Munich kindl one year later when he produced a cast bronze oval plaquette (GG-17). Listed at 75mm elsewhere the large cast may have been a shop model. It was the custom at the Goetz atelier to keep full-sized and fully realized 2-sided masters in their working inventory. There are, no doubt, galvanos of both sides of this hungartaler extant. This medal was privately struck in 1948. A fine acquisition for any top quality Goetz collection. 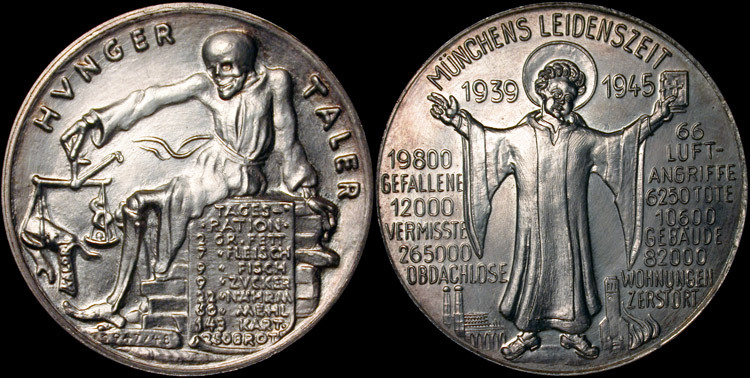 As a bonus, an extra 36mm aluminum piece struck by the Munich mint will be included with this purchase. GRADE: ST (UNC) As Struck, Beautiful champagne peripheral toning.